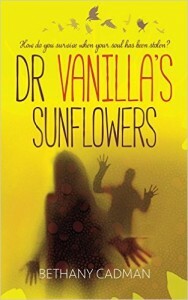 You can buy ‘Doctor Vanilla’s Sunflowers’ via Amazon, Waterstones, WH Smiths, Barnes and Noble and Google Books. Deborah is 33 years old; her husband has left her and her son is dead. With nothing left to live for, she makes an unsuccessful attempt to take her own life. In a desperate search for help, she visits the mysterious Doctor Vanilla, a therapist who specialises in suicide cases. What Deborah hasn’t realised is that on the day she tried to kill herself, she became separated from her soul, which is now helplessly wandering the earth trying to find its way back to her. Then she meets Luke, another soulless patient of Doctor Vanilla. As their relationship develops, and with the Doctor’s methods becoming increasingly sinister, Luke and Deborah start to suspect he has a terrible motive for seeing them. Soon reality begins to collide with Deborah and Luke’s dream worlds, and they realise their time is running out. Will they manage to rescue their lost souls – or does a dreadful fate await them? ‘An extraordinarily imaginative story by a highly original new novelist, set on the borderline between fantasy and reality’.